HARWICH, Mass. - Some patriots on Cape Cod are refusing to give up in a battle with flag thieves, reports CBS Boston. Last week, Rob Mador of Harwich, Mass. hung American flags and military flags on a Mid-Cape Highway overpass in Harwich. Flags on overpasses are not an unusual site driving around Massachusetts, but Mador chose the Harwich overpass because he knew a bike ride was coming through for the Wounded Warrior Project and he wanted the riders to feel a sense of pride. "We're patriotic people. We know what's going on. We're at war right now," Mador told the station. 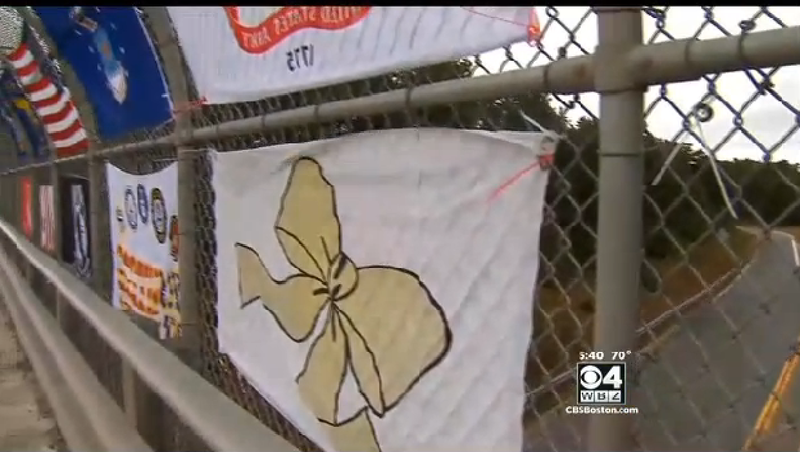 But just one day after Mador put the flags up on the Mid-Cape overpass, they were gone. Joined by his friend John McPherson, Mador replaced the flags. But thieves returned and stole them again, according to CBS Boston. "It's upsetting because we're supporting the troops and the families," McPherson said. "Once something like that happens it just makes us stronger." For a third time, Mador, McPherson and their friends put flags up on the overpass. Mador reportedly spent the night sitting in his car on the overpass to make sure the flags weren't taken. He said it's important for veterans who have gone through war, and who will deal with it for the rest of their lives, to know there are people who care. The thefts of the flags have angered some people in the area and local police are investigating. Harwich police Sgt. Kevin Considine told the station that out of all the bridges on the Cape that have flags on them, this is the only one that's been targeted.